One of my biggest events of the year was last night at The Marriott hotel in Leeds, for my second year at The Pink Ball, helping to raise money for cancer charities. Mood lighting round the room, a larger than usual sound system and a late finish. Thankfully everything went well. After the meal, auction and an X Factor style competition, I played for the last two hours, finishing at 2am. 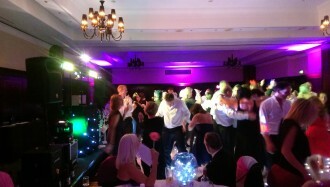 Great crowd and a packed dancefloor. And hopefully lots of money raised for the cause. This entry was posted in Events, Latest and tagged Charity disco, gary duncan, Holmfirth DJ, Huddersfield DJ, Party DJ on October 19, 2014 by bankerdj. Once again I seem to have been roped in to help the Zumba ladies! This time it is sound and lighting systems in two different rooms. This entry was posted in Events, Latest and tagged Charity disco, gary duncan, Holmfirth DJ, Zumba on April 16, 2014 by bankerdj. I am again pleased to have been asked to get involved with this years concert. Playing music for the kids at the start, then filling in between the bands and running the auction. It was a good one last year so I hop we get an even bigger crowd this time. This entry was posted in Events, Latest and tagged Charity disco, gary duncan, Holmfirth DJ, holmfirth picturedrome, Huddersfield DJ, NADJ on February 16, 2014 by bankerdj.